Common Prayer helps today's diverse church pray together across traditions and denominations. With an ear to the particulars of how various liturgical traditions pray, and using an advisory team of liturgy experts, the authors have created a tapestry of prayer that celebrates the best of each tradition. The book also includes a unique songbook composed of music and classic lyrics to over fifty songs from various traditions, including African spirituals, traditional hymns, Mennonite gathering songs, and Taize chants. 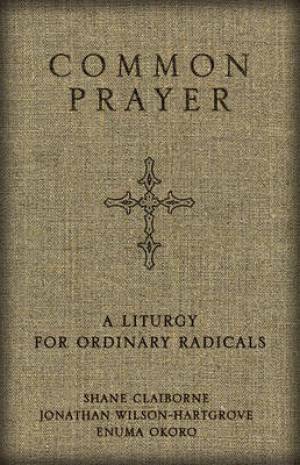 Tools for prayer are scattered throughout to aid those who are unfamiliar with liturgy and to deepen the prayer life of those who are familiar with liturgical prayer. Ultimately, Common Prayer makes liturgy dance, taking the best of the old and bringing new life to it with a fresh fingerprint for the contemporary renewal of the church. Churches and individuals who desire a deeper prayer life and those familiar with Shane Claiborne and New Monasticism will enjoy the tools offered in this book as a fresh take on liturgy. Common Prayer by Enuma Okoro; Jonathan Wilson-Hartgrove; Shane Claiborne was published by Zondervan in November 2010 and is our 7698th best seller. The ISBN for Common Prayer is 9780310326199. Common Prayer – one begins to wonder if there is such a thing! Common Worship is anything but common, with so many seasonal variations and authorised additional material. The major part of the book – over 500 pages – is morning prayer. On each day there is something about someone whose feast or commemoration day it is, or an event’s anniversary – Hiroshima Day, Kristallnacht for example; a responsory; some psalm verses – usually no more than 4 or 5; 2 Biblical readings; prayer for others and a closing prayer. To someone who uses the common worship daily office, this office appears thin in contrast: HOWEVER for someone looking for a simple daily pattern of worship it is ideal. The book is unmistakeably American – but it is none the worse for that: its authors being a Baptist, who is Director of the School for Conversion, a writer/artist/editorial consultant and the founder of The Simple Way, a radical faith community based in inner-city Philadelphia. I found the December-November format both familiar and comforting, though I cannot imagine using the book myself. I particularly liked the 12 full page woodcuts which form the monthly frontispiece. The book is bound with a single ribbon marker – surely for regular use it needs at least 4. I neither commend nor condemn this book – it is up to each individual to make up their own mind but it is worth repeating words from above: ‘for someone looking for a simple daily pattern of worship it is ideal’. Got a question? No problem! Just click here to ask us about Common Prayer.